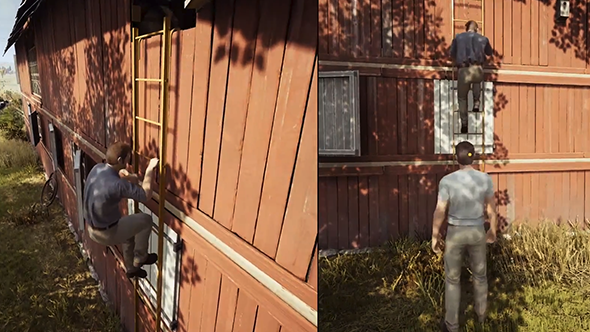 A Way Out is a prison escape drama built to be played in co-op. So, to run it through its paces, PCGamesN’s games editor Matt and I have written up our experiences, each playing as one of the two leading characters as we try to scramble through an intense sequence in the game together. He played the reserved, mild-mannered Vincent, while I played the arrogant bruiser Leo. I don’t know what it says about us that we both slipped into these roles with ease. To get the full story you will want to read along with Matt’s article and, to make it as easy as possible, we have uploaded a video of the section of the game we are talking about. 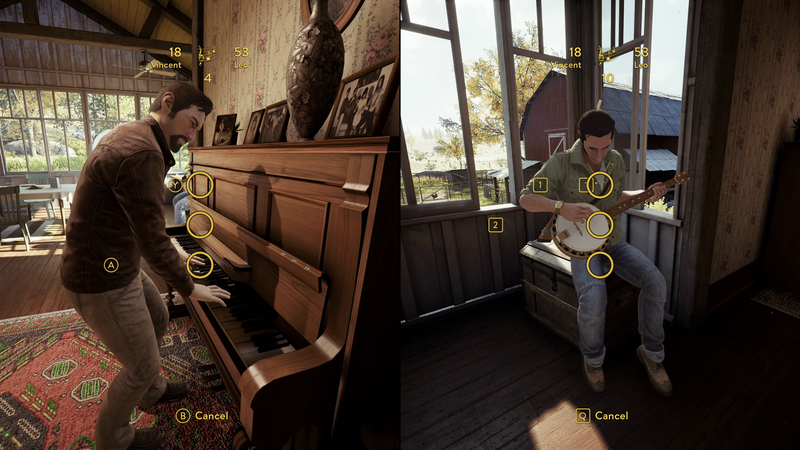 Dotted throughout this article are links that will hop you to the relevant point of the video so you can see how what we are describing plays out in-game. We need to get Matt out of his prison clothes. I could pass as a civvie in this t-shirt and chino combo – it looks like I’ve just wandered off a Calvin Klein advert – but Matt’s still wearing his prison blues. His shirt even has his prisoner number stitched onto the breast, for Christ’s sake. There should be something we can wear in the farmhouse up ahead but we’ll have to do something about the old folks inside. I’m for marching in and tying them up but Matt says he has a better way. Something about setting the horses loose. A choice wheel appears on screen and we must agree to take the same route before we can continue. If it will give me leverage in the next argument, we can go his way. We find a ladder in the garden and climb into the barn. I head down the stairs to release the horses from their stables. I unbolt the door but the animals aren’t budging. Matt gives me a shout from the top floor – he’s stood by a heavy cement mixer and has a wild look in his eye. Yes, that’ll do. I’ll admit, Matt’s plan worked pretty well. The old couple went running off after their horses and we got free rein of the house. Matt disappeared upstairs as soon as we got inside but I’m in no hurry. There’s nothing that says freedom to me like a cold beer, so I go straight to the fridge and drink the first drop of alcohol I’ve had in years – at least, the first drop that wasn’t brewed in a prison toilet. I take a slow walk around the ground floor, looking for the shotgun the old man was cleaning earlier. Moving into the conservatory I find shells but no gun. However, I discover something better: a banjo. Matt’s still busy upstairs so there’s no harm in me settling down and dusting off the old five-string. I take a seat by the piano and try to play through the wall of notes that stream across the screen, Guitar Hero style. I only have to tap three keys to play along but it’s a great diversion. 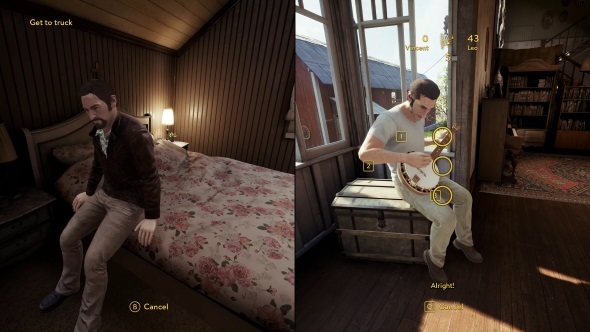 I might have got a little too caught up in trying to reach Deliverance levels of banjo-playing – Matt gives me a nudge to go upstairs and change. Upstairs, I find a great-looking hat. It’s not enough of a disguise on its own but I can’t help but take a long admiring look at myself in the mirror. There are lots of interactive objects in the house, things that you can’t take away or use, but which all add to the richness of the experience. I go into the old couple’s bedroom and find an old army jacket and jeans in the wardrobe. Better still, I find the shotgun. Now we’re ready for an escape. Almost. Downstairs I can hear Matt on the piano. Before we go… it’s time for a duet. I think it’s fair to say Matt needs some work. Anyway, dressed up in our new threads, we still need to procure a getaway car. In the yard I find a rundown tractor and a can of fuel. We can’t make a getaway on a farm vehicle but a wooden garage at the top of the drive looks promising. Matt and I have to kick the door to force the lock, tapping our use buttons in unison. The wood cracks inward to reveal a truck propped up on bricks. The vehicle will need some repairs before we’re going to drive out of here in it. I find an iron bar we can use to lever the truck up off the bricks but to get to the wheel on the first floor of the garage we have to work together. The wheel is on one side of the barn but there’s no walkway over to it. There is a hook attached to a runner that should clear the gap. Matt holds tight and I work the chain pulley to send him over to the other side of the garage. Once on the other side, Matt throws the wheel down to me and I fit it to the truck, holding ‘E’ to push down on the iron bar and raise it off the bricks while Matt tightens the nuts. We push it down the drive and fuel it up with the can I found earlier. Matt hooks the battery up to the tractor and with a turn of the key while I coax the engine into life. We are ready to make our getaway and it’s about time – the old couple are back and armed (just how many guns do they have hidden away in their house?). 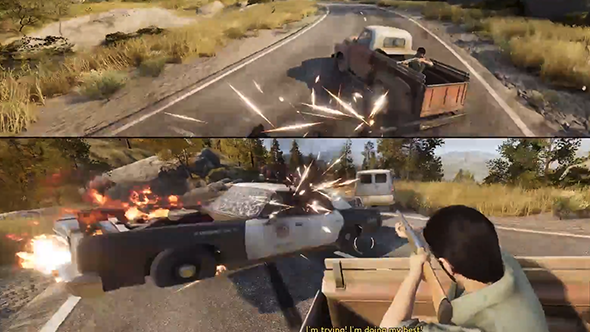 Matt takes the wheel and I climb in the back of the truck with my shotgun. The old folks must have called the police because the roads are suddenly full of cop cars. They’re not messing around either, speeding up behind and to the sides of us to ram our slow-moving truck into submission. Either the truck’s too slow or its driver too cautious but I’m forced to clear the roads with my shotgun. 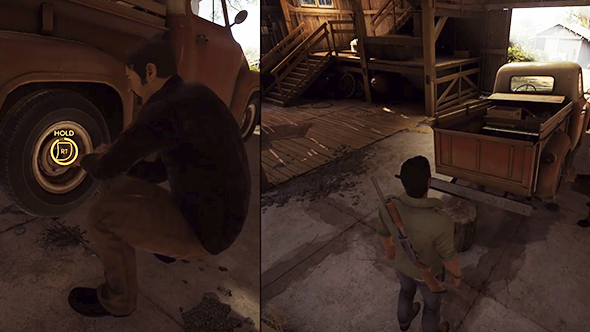 Following the almost Telltale-like pace of the previous section, this back-of-the-truck action sequence takes on the perilous speed of an Uncharted set-piece. I try aiming for the engines but that turns out to be a tricky target so I fire into the windscreens instead. I’m going to tell Matt that the cars stopped because they couldn’t see through the frosted windscreens. Not sure he’ll be completely OK with just how many police officers I killed. Still, onwards we go. I’ve just about secured our escape when Matt shouts something about spike traps and we go swerving off the road and down towards a river. It’s turning into a very long day.